Comfort has many faces. For instance, when an AluPure sliding system is opened and closed. Its precision fits make it extremely quiet and easy to use. 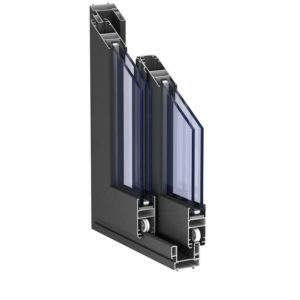 Even with large glazed areas, the AluPure profiles ensure that the sliding elements move in nearly perfect silence, a result of the window and door sashes’ high stability. Sliding systems are an important and style shaping element for your house and home. AluPure profiles give sliding elements an appealing, distinctive look – thanks to the clear design of the sash profiles. The centre section with a door handle from top to bottom provides convincing static properties, also for the generous dimensioning of the sliding elements. This is aided by a modular frame system for the range of variants. So you can enjoy the maximum freedom when dimensioning the height and width of your door. It has multi point locking to get higher security. Optionally the sliding units can be equipped with an insect screen, using a special sliding frame. This insect screen offers effective and reliable protection against vermin, mosquitoes, flies and other insects. 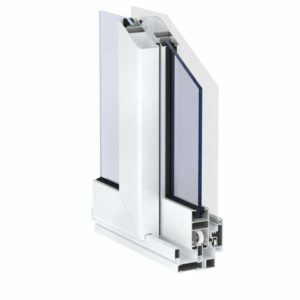 The stable aluminium frame can also be used as central transom, thus permitting also larger units. The insect screen consists of robust fibre glass tissue with a cover of synthetic material and is extremely tear- resistant and long- lived. The optionally adaptable guiderails integrate the track rollers of the insect screen sliding unit and permit a long- lasting and easy operation.The circumferential brush gaskets allow a secure and complete closure. This way, you can make your home more comfortable, as you can leave the sliding units open without annoying insects coming into your house.